It’s fair to say that, for many people, Sonic’s “golden age” was the 16-bit era that encompassed his first four(ish) games. What doesn’t tend to get talked about quite so much is the fact that, around the same time, there were some fantastic 8-bit releases in the series on Sega’s Master System console and ill-fated Game Gear handheld. So, well, let’s talk about that, shall we? The 8-bit version of Sonic the Hedgehog was released in December of 1991, six months or so after its better-known 16-bit counterpart. It was an attempt by Sega to raise consumer awareness of its 8-bit colour handheld gaming device, the Game Gear, which had been released in Japan a year earlier. The Game Gear, although a pretty neat device in theory, was something of a misstep for Sega in the early ’90s. While they had achieved some success with the Mega Drive, partly thanks to their positioning of the console in North America as a more “mature” device than what its main rival Nintendo offered, it turned out a similar approach did not work quite so well with the portable. There are a number of reasons for this; firstly, although the Game Gear was — in some ways, at least — technologically superior to its main rival , Nintendo’s Game Boy, that superiority came at a price: battery life. While Nintendo’s non-backlit monochrome handheld would last for up to 30 hours on four AA batteries, the backlit colour LCD Game Gear would barely manage five hours on six of the same batteries. This obviously limited the “portability” of the system somewhat, especially when coupled with the device’s somewhat bulky design — although, granted, it was no Atari Lynx in this regard. Secondly, and perhaps more significantly, Sega of America’s marketing for the Game Gear crossed something of a line by outright insulting both Nintendo and Nintendo’s audience. A somewhat notorious TV commercial for the console featured an obese young man hitting himself in the head with a dead squirrel in an attempt to “see” colour on the monochrome Game Boy, and a print ad suggested that “if you were colour-blind and had an IQ of less than twelve then you wouldn’t care which portable you had”. Nintendo took particular exception to this latter one, somewhat understandably. Despite all this drama, however, the Game Gear managed to find something of an audience, and the presence of Sonic on the platform almost certainly helped a great deal with that. Particularly because Sonic the Hedgehog for Game Gear is a great game in its own right — and completely different to its 16-bit big brother. While Sonic Team was busy preparing the 16-bit version of Sonic the Hedgehog for release, a young composer named Yuzo Koshiro was putting the finishing touches on his soundtrack for the Mega Drive version of The Revenge of Shinobi. Koshiro happened to mention to a manager that, despite his lack of practical experience, he knew a thing or two about actually developing games as well as producing their soundtracks, and consequently found himself tasked with the development of Sonic’s first 8-bit adventure, initially for Game Gear and subsequently for the Master System as well, which had very similar internal hardware. 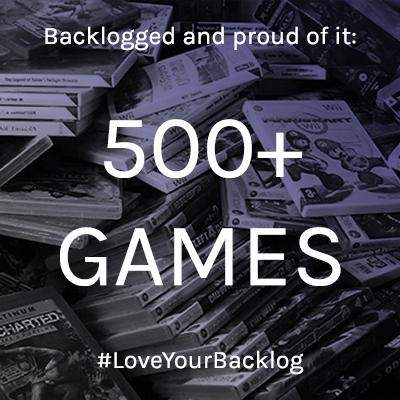 Koshiro founded an initially family-run outfit called Ancient as part of this process, since Sega’s regulations at the time prevented the company from forming contracts with individuals, and set about working on the new project. It quickly became clear that a direct port of the Mega Drive version was out of the question, so Koshiro and his team set about producing something unique that kept in mind the spirit of the original. The result was — and still is — regarded as one of the best platformers on both the Game Gear and the Master System, taking a somewhat different approach to its 16-bit counterpart by emphasising exploration over speed, an angle which Sonic CD would return to in 1993. Most of the recognisable Sonic elements are there, though — monitors to break for power-ups, rings to collect to protect against damage (though in this incarnation you can’t re-collect any rings you drop) and, of course, boss fights against the evil Dr. Robotnik. As you might expect, Koshiro’s primary experience in composing for video games meant that he worked hard on the game’s soundtrack. His process began with the porting of Masato Nakamura’s MIDI soundtrack from the Mega Drive to the Game Gear and Master System’s PSG chip, but ultimately ended up only re-using three of the original tracks; the rest of the game made use of Koshiro’s own compositions. One of these, for the game’s second area, Bridge Zone, is popularly regarded as being “borrowed” by Janet Jackson for her 1997 track Together Again — not helped by a popular video from the otherwise excellent Gaming Historian in which he erroneously described Jackson as “sampling” the song. Game Gear Sonic features a few noteworthy differences from its 16-bit counterpart. Perhaps most significantly, Chaos Emeralds are simply found lying around in the levels, encouraging exploration rather than simply charging through as quickly as possible. Special Stages are present by completing levels with 50 or more rings as is the early series tradition, but these are for earning points and continues rather than acquiring Chaos Emeralds. And the traditional end-level signpost now provides random bonuses rather than simply marking the completion of the stage. Much like the Mega Drive version, Game Gear Sonic takes cues from Sega’s background as an arcade game maker in terms of structure. There is no save system, and once you run out of lives and continues, it’s right back to the start of the game for you. This, coupled with the hidden Chaos Emeralds, gives the game a bit more longevity than it would otherwise have; it’s quite an easy, short adventure, particularly for veterans of the series, but that also makes it an ideal entry point. Game Gear Sonic is emphatically a Good Thing, then. 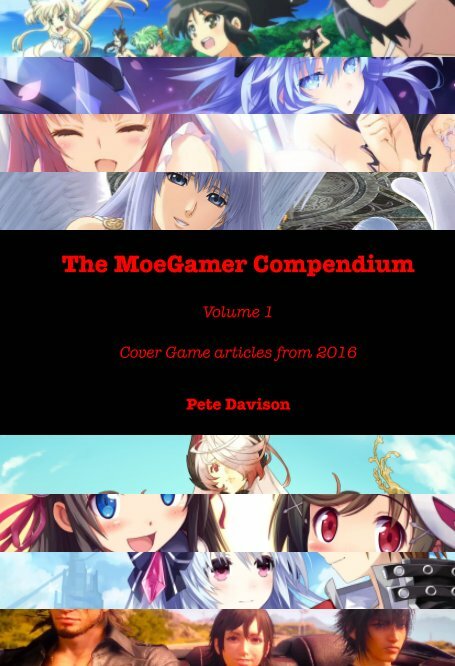 So where did the series go from here? Sonic the Hedgehog 2 was developed by Aspect, who had previously worked on Ax Battler: A Legend of Golden Axe and Batman Returns for the Game Gear and Master System. The game released in October of 1992 — in Europe first, interestingly, thanks to the strong support of the Master System in that region — before following to the rest of the world the following month, around the same time as its 16-bit counterpart. Once again, 8-Bit Sonic 2 was a radically different game to the Mega Drive version, incorporating completely different levels, bosses and overall structure. 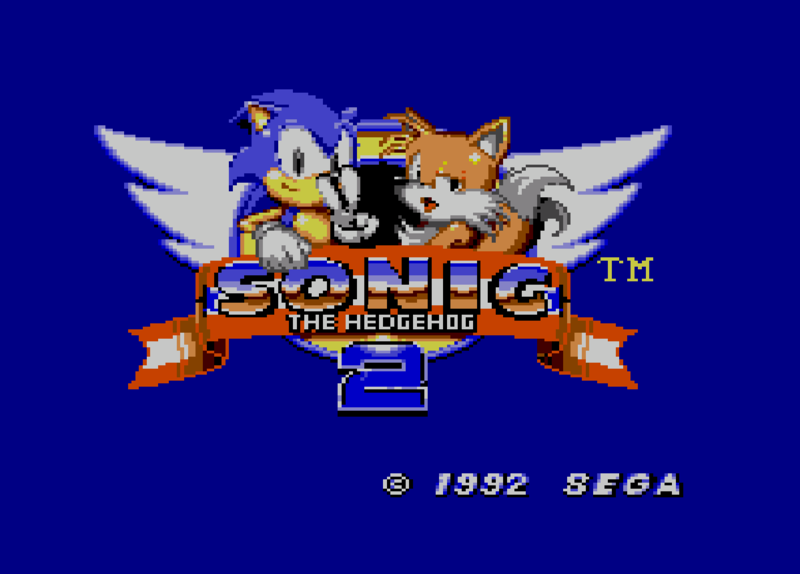 Thanks to the October release of the game in Europe, 8-Bit Sonic 2 actually marked the very first time Tails appeared in any Sonic game worldwide — though despite the character appearing prominently on the box art, title screen and level introduction splash screens, he is not playable at all, since the main point of Sonic’s quest this time around is to rescue his fox friend. 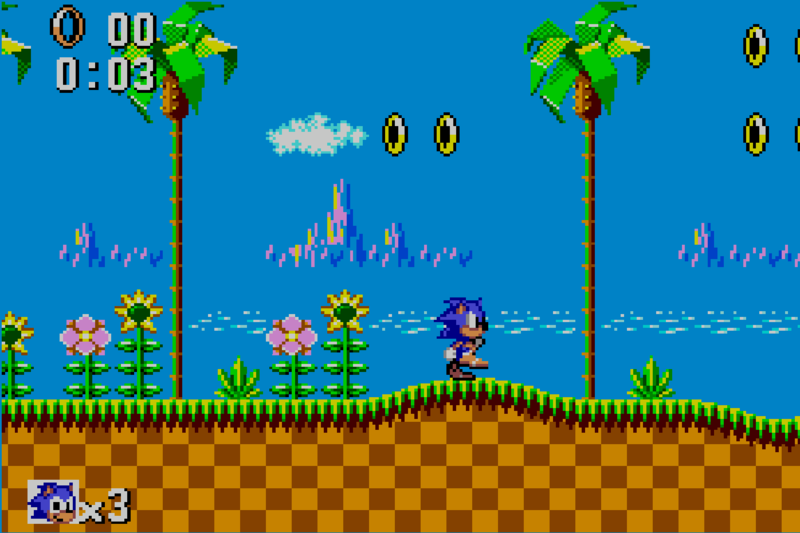 8-Bit Sonic 2 made a few adjustments and refinements to the formula of its predecessor. The shield and restart marker items could no longer be found in the game, for example, and the third act of each zone consisted entirely of a boss fight with no rings whatsoever to protect you, making for some of the most challenging encounters in the series. 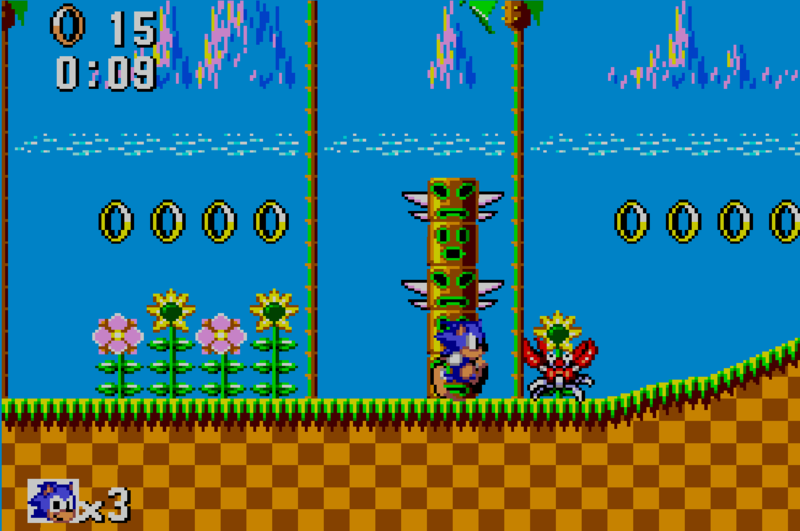 The game did, however, add the ability for Sonic to break through blocks by rolling through them as in the Mega Drive original, though the new Spin Dash manoeuvre from its 16-bit counterpart was nowhere to be seen, meaning you’d need to get a good run-up in order to successfully blast through a wall. The game also added a number of unique movement-based stage gimmicks such as mine carts in the initial Underground Zone and hang-gliders in the Sky High Zone. 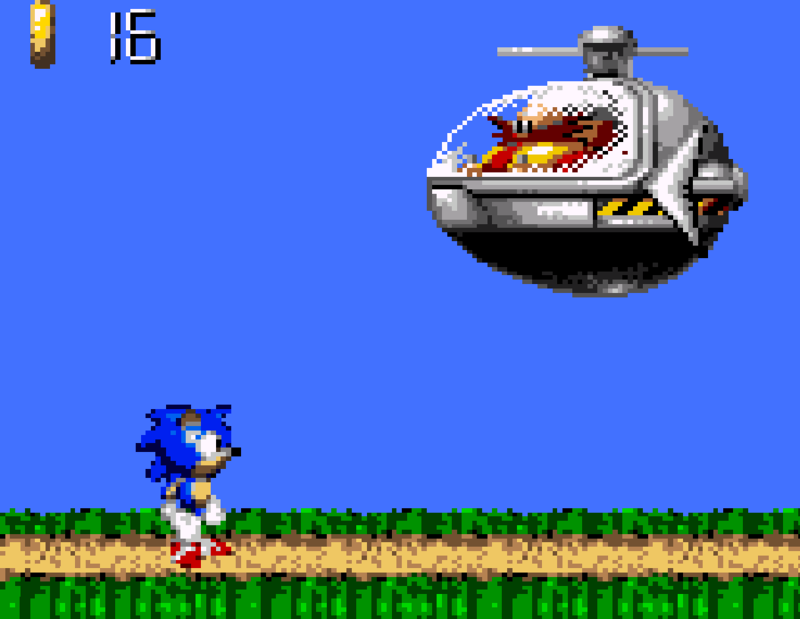 These varied in their overall effectiveness; the mine carts made for some entertaining “rollercoaster” sections, but the hang-gliders were notoriously hard to handle, often landing Sonic in a bottomless pit if you didn’t approach them at a high enough speed. One interesting consideration with 8-Bit Sonic 2 is that despite technically being the “same” game (aside from a few minor differences in music and boss stage layout), the Game Gear version is significantly harder than its Master System counterpart. So much so, in fact, that Game Gear Sonic 2 is regarded as one of the toughest Sonic games in existence — though it’s pretty clear that this wasn’t intentional. 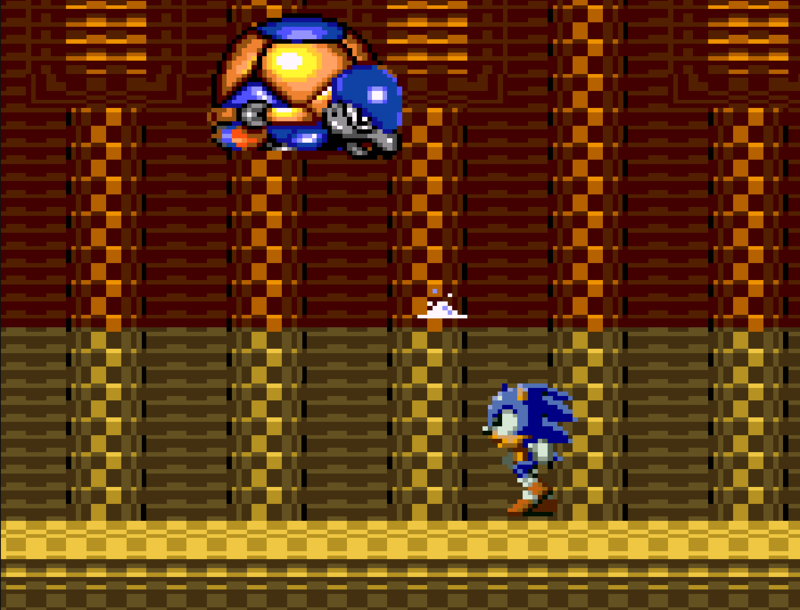 Instead, it is largely a side-effect of the Game Gear’s low resolution square screen and relatively large sprites of the game; it’s hard to see ahead of where you are, making for numerous “leaps of faith” and instances where the player requires extremely fast reactions to respond to fast-moving obstacles coming from off-screen. The boss encounter at the end of the first zone, in which you must jump over or pass under bouncing balls, is one of the most notorious examples of this. On the Game Gear, this sequence is very difficult, and proves a common sticking point for new players; on the Master System, meanwhile, the considerably enlarged, rectangular screen makes it a relative breeze since you have a lot more time to prepare and respond to the situation. 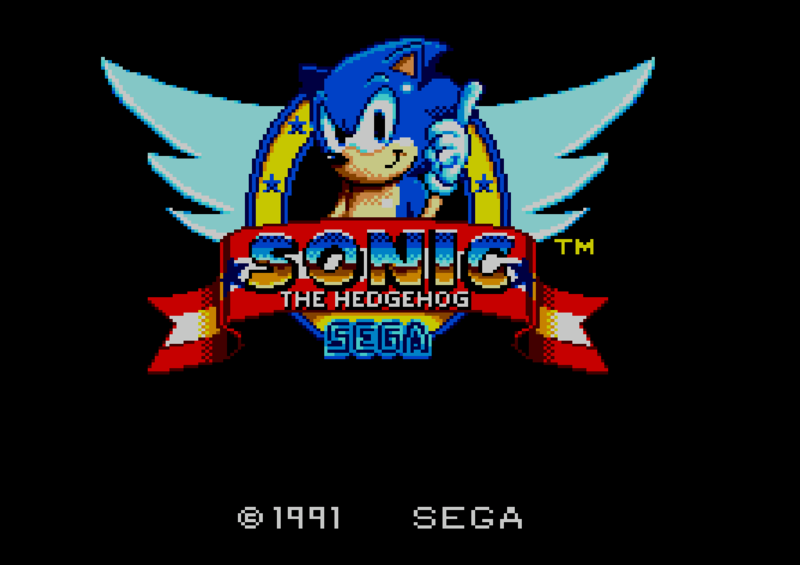 Relative difficulty aside, both 8-bit versions of Sonic 2 remain worth playing. They look good, play well and have a great soundtrack (despite the maestro that is Koshiro having no involvement in them) — and, in fact, the music for this game’s “Green Hills Zone” [sic] went on to become both the main theme song for Sonic CD and the invincibility music in Sonic Adventure. From this point on, Aspect became the default developers of the 8-bit versions of Sonic the Hedgehog — though also from this point on, Sega made the (perhaps wise) decision to stop numbering the 8-bit installments, presumably to prevent confusion with the mainline 16-bit games. 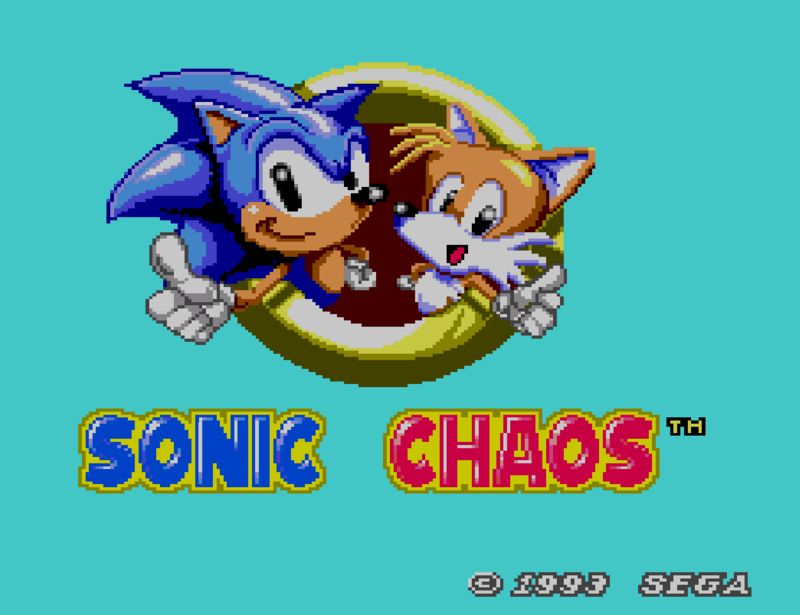 Instead, the next 8-bit title in the series was Sonic Chaos (known as Sonic and Tails in Japan, and occasionally referred to as Sonic the Hedgehog Chaos), which released for Game Gear and Master System in 1993. This time around, PAL regions were the only ones to get the latter version, once again a month ahead of the worldwide release of the Game Gear incarnation. The Master System’s PAL exclusivity was likely due to the fact that the platform had been officially discontinued in North America in 1992, but remained popular in regions such as Europe and Brazil. Sonic Chaos shows that Aspect clearly learned some lessons from the Game Gear version of Sonic 2; the experience feels much less cramped on the handheld and is a lot more accessible and playable as a result. In fact, the Game Gear version is arguably preferable to the Master System port in some regards; it runs a little faster and more smoothly, with less obvious slowdown. 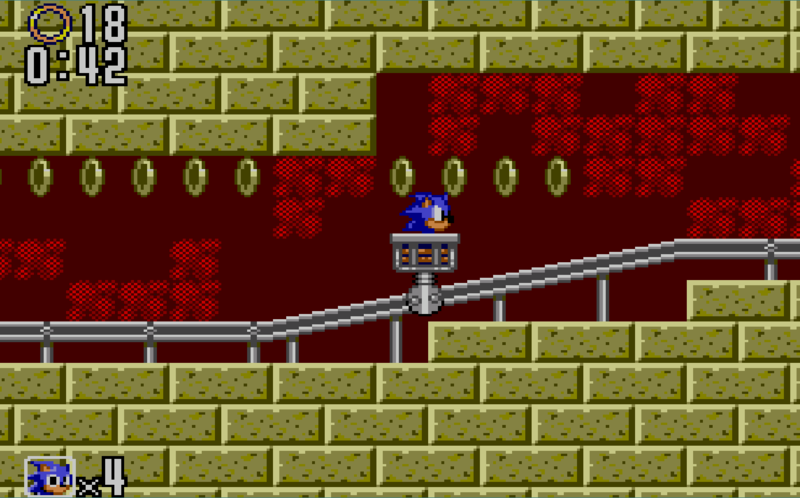 Aspects of the 16-bit titles were also incorporated into the new game, such as loops and corkscrews in the levels and Sonic having access to both his Spin Dash move from Sonic 2 and the Super Peel-Out from Sonic CD. Tails was also a playable character for the first time on 8-bit platforms and, releasing a year ahead of Sonic 3 on Mega Drive, Sonic Chaos marked the first time Sonic and Tails had distinct abilities from one another. Tails effectively operated as a sort of “easy mode” for the game, since he was able to fly for short periods as well as starting the game with more lives and continues. He was, however, slower than Sonic and was unable to enter the game’s Special Stages to collect Chaos Emeralds, consequently meaning it was impossible to get the game’s “good” ending with him. The intention was presumably for inexperienced players to learn the game with Tails before graduating to Sonic in an attempt to clear it “properly” — though the game as a whole is something of a notoriously easy installment in the series, so Sonic veterans shouldn’t have too much trouble even if they start with the blue blur himself. Casting aside its technical proficiency, however, Sonic Chaos is a solid entry in the series that remains well worth playing. Okay, so you can probably blast through it in an afternoon if you’re well familiar with 2D Sonic games in general, but that doesn’t make it any less enjoyable to play through if you’re looking for a quick hit of early ’90s fun. Definitely a worthy installment. Sonic Chaos was followed up a year later by Sonic the Hedgehog: Triple Trouble, which was developed exclusively for the Game Gear as a direct sequel to Sonic Chaos — indeed, in Japan it was simply known as Sonic and Tails 2. Triple Trouble was clearly an attempt to ride the coattails of Sonic the Hedgehog 3, which had released earlier in the year. Knuckles made his first appearance in the 8-bit games in this installment, for example, and the narrative setup was very similar to Sonic 3: the echidna was tricked into becoming an “antagonist” by Robotnik, who was seeking the Chaos Emeralds for himself. This time around, however, there’s a third antagonist, though he only puts in an appearance in Special Stages: Nack the Weasel, later rebranded to Fang the Sniper for subsequent appearances and cameos. Gameplay-wise, Triple Trouble remained pretty close to Sonic Chaos’ execution, with Sonic and Tails once again having distinct abilities. This time around, however, Tails was able to collect the Chaos Emeralds as well as Sonic, and the levels were considerably more expansive than its predecessor, with many critics comparing this aspect of the game favourably to the Mega Drive games. The game was also a little peculiar in that taking damage didn’t drop all your rings in one go; instead, hitting an enemy would cause you to drop 30 rings, while hitting spikes would lose you 50. This variation on the Rings mechanic has been used a couple of other times throughout the series, but nowhere near as often as the more common “all or nothing” approach. In another unusual step for the series, Special Stages weren’t completely homogeneous. 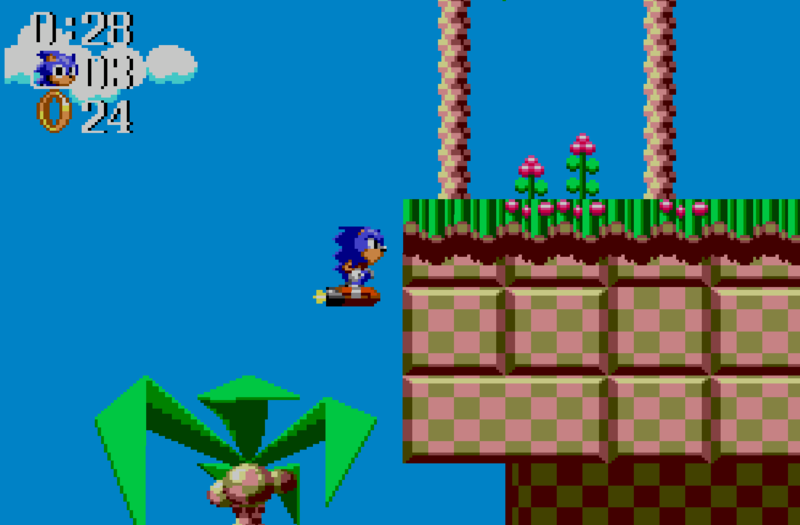 Instead, odd-numbered stages consisted of mazes to negotiate, while even-numbered stages required the player to pilot Tails’ aeroplane, the Tornado, to collect rings and avoid bombs. Each Special Stage concluded with a showdown against Nack/Fang to wrest control of a Chaos Emerald from him with, as usual, all Chaos Emeralds required to unlock the game’s best ending. 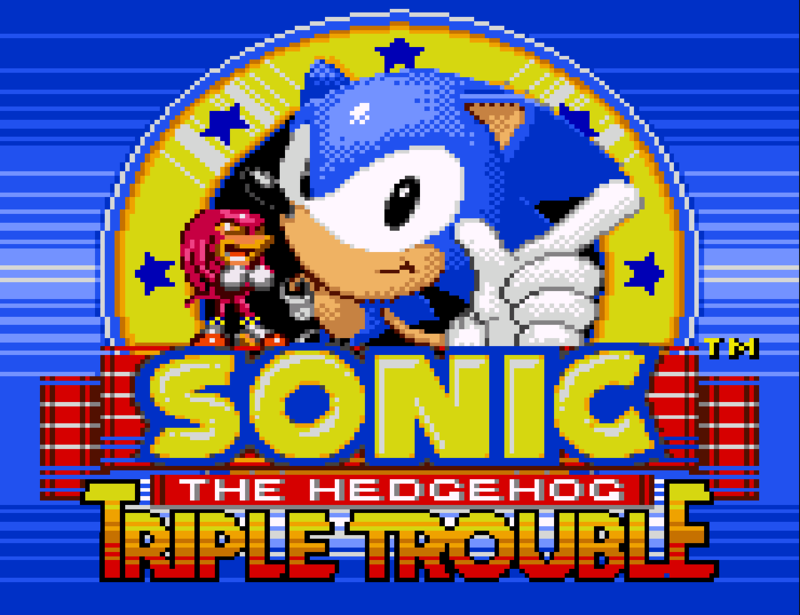 Triple Trouble was seemingly less well-received than Sonic Chaos on its original release, with critics feeling it was still too easy to complete despite its expanded levels and additional features. 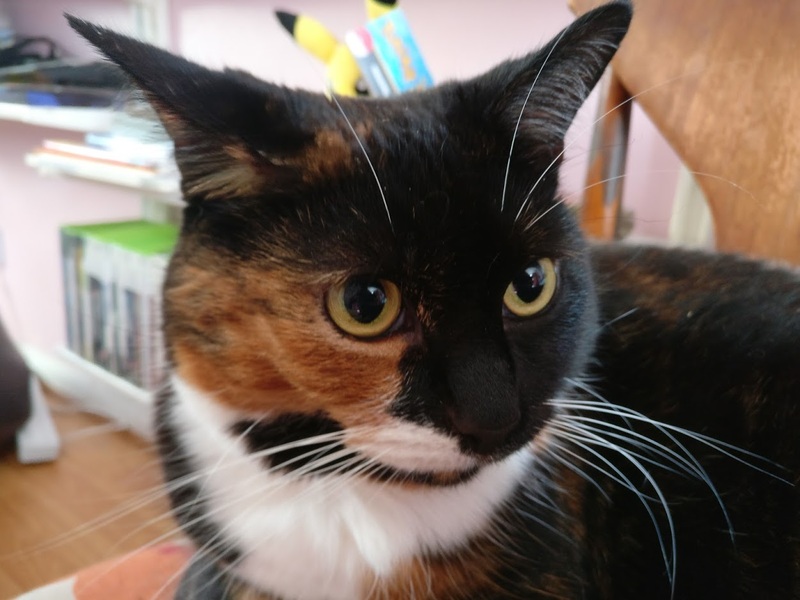 It fared even worse when it made a reappearance as part of the Sonic Gems Collection for sixth-generation consoles, with various outlets referring to it as “intolerable” and “tedious”. This hasn’t stopped it being a popular installment and something of a cult classic with fans, however — and if you haven’t had your fill of 2D 8-bit Sonic by this point, it’s still well worth a look. Finally, we come to Sonic’s last platforming adventure for the Game Gear: 1996’s Sonic Blast. Despite releasing at a similar time to Traveller’s Tales’ Sonic 3D: Flickies’ Island (aka Sonic 3D Blast), the two games have nothing to do with one another aside from some similar box art and the use of prerendered 3D models instead of hand-drawn pixel art sprites. Sonic Blast is one of the least favourably remembered games of this particular era in Sonic’s history, and much of this stems from those graphics. Rare’s SNES title Donkey Kong Country had popularised the use of pre-rendered 3D models as sprites in 1994, so numerous other developers had attempted to follow suit, to varying degrees of success. 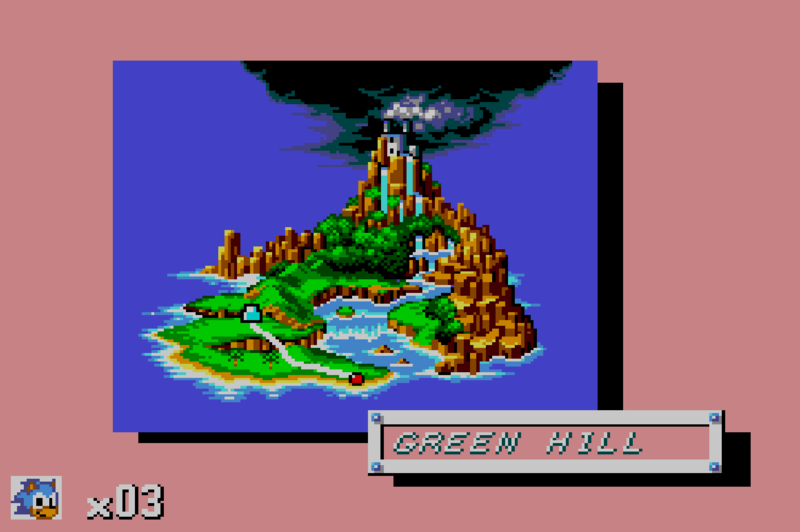 The limitations of the Game Gear were particularly apparent in this regard, since the limited colour palette of the system compared to the SNES meant that Sonic Blast’s visuals came out rather muddy — and, moreover, in order to retain a certain amount of detail in the sprites and backdrops, the sprites were rather large, leading the game to feel somewhat “zoomed in”. Thankfully, this issue is less of a problem than it was in 8-Bit Sonic 2, with it being pretty rare that you’ll be killed by something you can’t see. 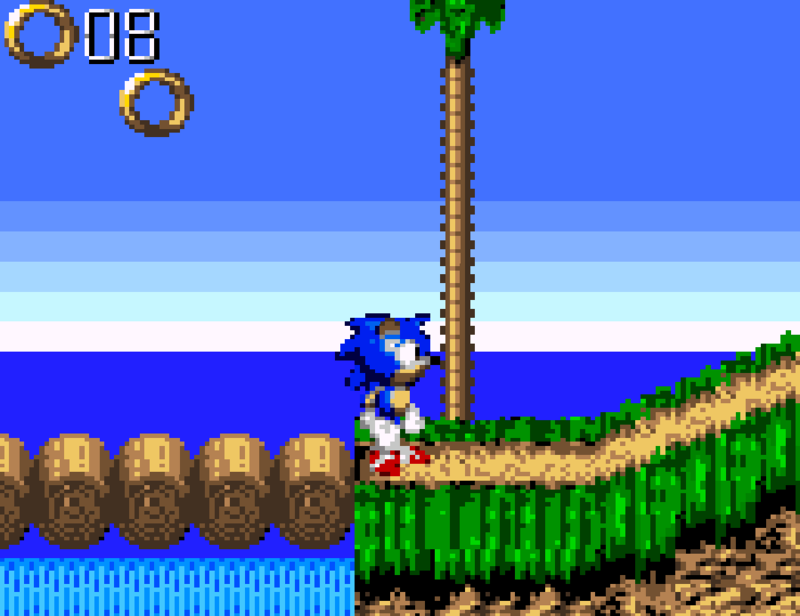 However, graphics weren’t the only issue people found with Sonic Blast; the gameplay also felt significantly slower than previous installments, with this being especially apparent when making use of the Spin Dash manoeuvre, which feels rather sluggish. That said, there’s fun to be found in Sonic Blast for sure. In this particular installment, you can play as either Sonic or Knuckles, with the former having a higher speed and the ability to double-jump, while the latter has his abilities from Sonic & Knuckles, including gliding and climbing walls. Each level feels quite different when tackled with the other character, and this adds some enjoyable replay value to the game. The slower pace also makes the overall game structure more conducive to exploration, with most levels having a variety of routes you can explore and hidden areas to uncover. Even the graphics aren’t all that bad once you get used to them. There’s strong use of bright colours, particularly in the backgrounds, and the pop art-style intermission screens between levels are attractive and distinctive. And the visuals are complemented by some catchy tunes and satisfying sound effects that make good use of the Game Gear’s PSG chip. 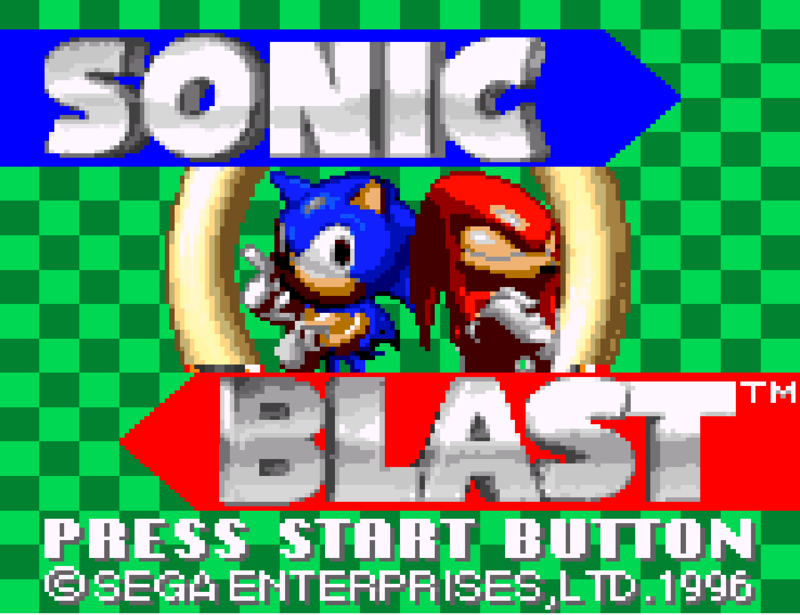 Despite being described by some critics over the years as one of the worst Sonic games in existence (a descriptor which I feel is somewhat unnecessarily harsh; the game isn’t broken by any means), Sonic Blast remains worth checking out — if only to see the swansong of the dear old Game Gear, which actually ended up leading a surprisingly long and happy life despite selling ten times less than Nintendo’s Game Boy in a similar timeframe. It’s clear that there wasn’t really anywhere else for Sonic to go in the 8-bit space after Sonic Blast, but that’s nothing for Sega to be ashamed of; five years with a Sonic game in each is nothing to sniff at… and this isn’t even getting into some of the interesting spin-off games that released in that period, either. We’ll leave that as a discussion for another time, though; suffice to say for now that if you’ve never checked out Sonic’s 8-bit titles and have had some fun with the Mega Drive games over the years… be sure to check at least a couple of these little gems out when you get the chance. Mentioning both the game gear and the Atari Lynx brought back this memory when I was still at school. One day there was a great party at the school where there were rows upon rows of Atart Lynx’s and Game Gears that we could try out. Unlike other kids I did not have a game console during those days, and I looked in bewilderment how cool these handhelds were. I can’t remember much else about those, as it was a long time ago, but I do remember that I enjoyed playing on them that day quite a lot. Ah nostalgia!…Never knew about the battery life by the way. Wow…5-6 hours that really is short. No wonder this did not quite take off….. I really love my Lynx but the battery life was to put it mildly, disastrous. They even released a “battery pack” that let you run the system off C (or maybe D) cells instead of AAs… it might have lasted a little longer but it was an expensive way to keep your handheld away from a plug in a wall. I played Gauntlet: The Third Encounter on the way home from my grandparents one day — probably about a two and a half hour journey. My batteries ran out just as I was about to beat the game for the first time. Heartbreaking. Sega didn’t help to pacify the console war with those commercials haha. To this day I have yet to beat the boss of the first level of Sonic 2 on Game Gear. Seriously screw that minecart BS and that ant-lion beastie. Likewise. Did it first time on the Master System version, meanwhile.